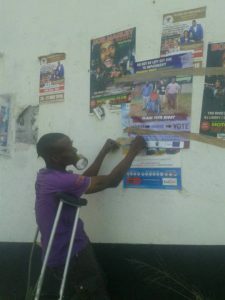 Distributing of flyers and pasting posters to encourage people with disabilities to go register to vote, inspect the voters roll and participate in the actual voting. The same material was developed for people with visual impairments and directly given to beneficiaries. Encourage someone!